George and Ann Colony pose with their son Charles ’17 outside Pettengill Hall on Mount David Summit Day. George and Ann Colony P’12, P’17 have pledged $3 million to endow the Colony Family Professor of Digital and Computational Studies, one of three new professorships within the college’s new Program in Digital and Computational Studies. 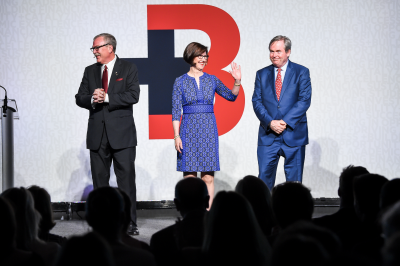 “We gave to support the college’s efforts to widen course offerings in computer science — an important discipline that touches all aspects of the liberal arts in the 21st century,” said George and Ann. The Colonys have also chosen to support the college’s commitment to financial aid. 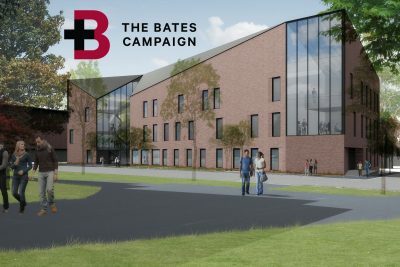 Their gift of $500,000 in 2011 to create the Colony Family Scholarship Fund ensures that the opportunity to attend Bates is available to talented students regardless of their families’ financial circumstances. 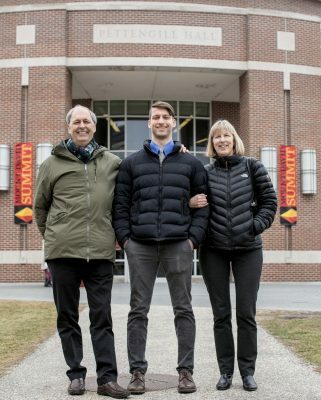 “We make Bates a philanthropic priority because we believe it’s a unique American college,” said George and Ann, whose sons William ’12 and Charles ’17 and their cousins Joel ’06 and Izola Porter Brown ’93 are alumni. George Colony is the founder, chairman, and CEO of Forrester Research, a global business and technology advisory firm in Cambridge, Mass. Ann Colony earned her J.D. at Boston University School of Law and does work for several conservation organizations.